After the success of last year’s sell-out festival, Simon Says… returns to De Montfort Hall and Gardens. Presented in partnership with three of Leicester’s most loved music venues, The Donkey, Firebug and The Musician, the festival is a celebration of local talent with some more nationally-recognised names complementing the line-up. Alongside them will be new age reggae band By The Rivers, tipped as one of the “five future stars of the Pyramid Stage” by the BBC. Building on last year’s success, this year the festival will have an expanded outdoor area with extra stage, a family area, more food stalls and real ale from event sponsor Hobgoblin. With the perfect setting of De Montfort Hall’s beautiful gardens as well as the iconic hall itself, Simon Says… is the perfect city centre festival with a rural feel. Come and join us for the weekend. Simon Says Simon Says… we’re back! The Della Grants have undergone something of a transformation since they started back in 2000, albeit in a different guise as a covers band. Today the Della Grants have found their soul… and its colour is blues!!! A 4 piece outfit, as blues as they come, comprising of Max Manning and Tom Best on guitar, harmonica and vocals respectively and Andy Boulton on bass, with Tom Walker on drums. The Della Grants have built-up something of a reputation as being the ones to watch and I can see why! and the likes of Mark Stanway, who played organ (I’m a sucker for a Hammond organ!!!) on their studio recording of ‘Keeping Me Away From You’. Mark Stanway has played with the likes of Jeff Beck Robert Plant and Manfred Mann’s Earth Band, so something of a coup for The Della Grants, add to this to opening for Dr Feelgood at the Musician in Leicester, and its not bad at all for the C.V. at all! I look forward to seeing them again at SimonSays in July. © copyright: TheGuyWithaStick.com2014© All rights reserved. 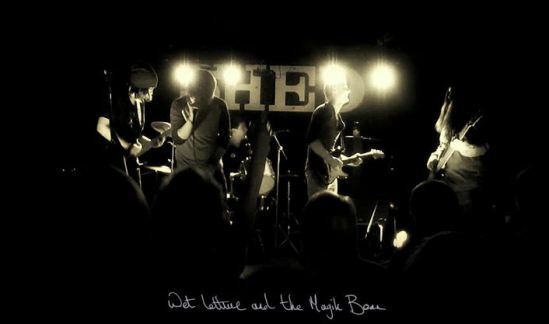 Fresh from Glastonbudget 2014, Beneath the Lights are a 4 piece, alternative rock band with an emphasis on ROCK. A young bunch of lads but don’t let that fool you, theses guys have a lot of experience, playing across the region in small venues and on the larger stage such as ‘Glastonbudget’, which they have played 3 times (or is it 4 now? I’m sure they’ll correct me!!!). Finalists in the OBS, held at the Musician in Leicester, Beneath the Lights are winning people over wherever they play (Ryan at TheGuyWithaStick.com is raving about them… I think he likes!!!). Energetic guitar play with thumping rock beats and dual vocals, these guys ouse charisma as they bang out covers along with intelligently thought-out originals such as ‘Broken Town’ and ‘Moving On’. The guys tell me they ‘love playing live’, a cynic would say ‘they all say that don’t they’… but wait! take a look at their gig list! They are just as comfortable playing at a local social club as they are playing the festivals and it shows in their stage presence and rapport with the crowed. So, Beneath the Lights are hard working, charismatic, talented and energetic what more can I say?… I know, going places, these guys are going places.. truly! I will be very surprised if the ‘unsigned’ label isn’t changed sometime in the foreseeable future. Their hard work will pay off in the end and we wish them well with it!